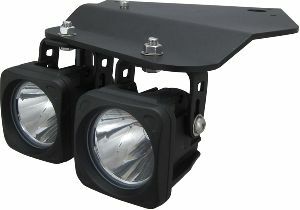 Showing 1 - 4 of 4 Products for Fog Light Mount Kit. 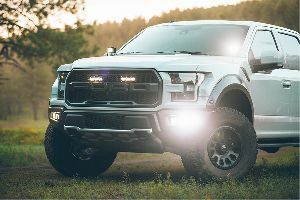 The 2015 Ford(R) F-150(R) Dual Fog Light Mounts from Rigid Industries secure 2 sets of D-Series or SAE Compliant lights into the existing fog light openings on your vehicle. These mounts bolt into existing factory location holes for easy installation. All of Rigid's OE Brackets and Mounts are made with 100% stainless steel and covered with UV and abrasion resistant powder-coat to ensure years of use in the harshest conditions. The 2017-2018 Ford Raptor Fog Light Mount Kit allows you to mount our D-Series (Dually or D2) LED lights (not included) in your Fords OEM fog lamp locations. This kit gives your otherwise square D-Series lights a clean from-the-factory look without having to drill or cut into your bumper. 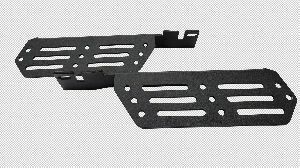 Made from high quality stainless steel, these adaptor plates are powder-coated black for a long-lasting finish. This kit comes with everything you need to install 6 D-Series lights (not included) in both fog light locations and is backed by Rigid Industries limited lifetime warranty. Fits 6 D-Series. Triple The Light Output Of Factory Lights. Bolts Directly to Factory Mounting. Maintains The Factory Appearance Of Your Vehicle. Black Aluminum Housing. Easy Installation. N-FAB is the industry leader in making quality Nerf-Bars, Pre-Runners and other Off-Road accessories. We design and manufacture the strongest, most durable and best looking Nerf-Bars available in the industry today. At N-FAB are committed to building a heavy duty, high end, high quality tubular parts for all the latest trucks and SUVs dating back to the 80s. When others are using thinner and thinner tube to cut cost we still use heavier gauge .084 wall steel, with an all welded one piece construction. We Zinc coat each part for better corrosion protection. Lastly we finish our standard parts in a thick layer of high gloss powder-coating for a long lasting finish coat. These standards far surpass any of our competition. If you want products that are unique and designed to last longer, look cleaner, function better then N-FAB has what you are looking for!